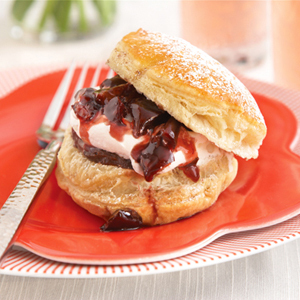 Puff pastry makes these whoopie puffs lighter than their traditional counterparts...and the chocolate pudding and cherry filling makes these absolutely delicious! Heat the oven to 400°F. Stir the cherries and vanilla extract in a small bowl. Sprinkle the flour on the work surface. Unfold the pastry sheet on the work surface. Cut the pastry sheet into 9 (3-inch) circles. Place the pastries onto a baking sheet. Bake for 15 minutes or until the pastries are golden brown. Remove the pastries from the baking sheet and let cool on a wire rack for 10 minutes. 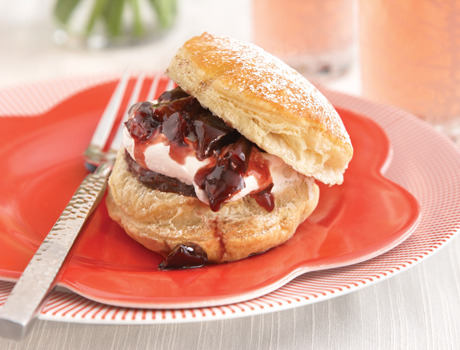 Split each pastry into 2 layers, making 18 in all. Beat the pudding mix and milk in a medium bowl with a whisk for 1 minute. Cover and refrigerate for 20 minutes. Spread about 1 1/2 tablespoons pudding mixture on each bottom pastry layer. Top each with about 1 tablespoon whipped topping and about 1 tablespoon cherry mixture. Top with the top pastry layers. Sprinkle with the cocoa powder.